"Yummy fried potatoes with the flavor of Kentucky. Easy to make while camping or at home. Leftovers store great in the fridge for a microwave breakfast on the go. For an East Coast twist, add diced green pepper." Heat the bacon drippings in a large skillet over medium heat. Add potatoes and onion, and stir to coat. Cook, stirring occasionally, until potatoes are tender and golden brown, about 15 minutes. Season with salt and pepper, and serve. 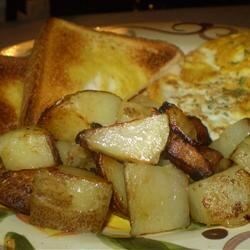 See how to make Chef John's perfect diner-style breakfast potatoes! These are wonderful. I have been making them just this way for years. Sometimes I like to add just a touch of garlic. I also like to cover mine between stirring to help soften up the potatoes. I cook the potatoes for about 10 minutes first, then add the onions and peppers and cook for another 10 minutes... it keeps the onions from burning.